Guernsey FC boss Tony Vance was delighted to see his side return to goalscoring form after their 4-2 win at Horsham in the Isthmian League Division One South. Having scored once in their previous three games, Mark McGrath netted twice in the first half and Dominic Heaume got the third before the break. Forward Glyn Dyer added Guernsey's fourth after the interval. 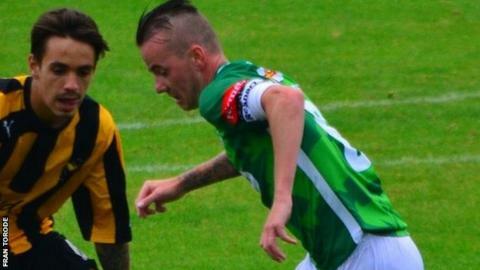 "It's really pleasing to score four goals," Vance told BBC Radio Guernsey. "We created numerous chances, we've been doing it all season and we haven't managed to put the ball in the back of the net. "If we apply ourselves in the same manner I'm confident we can beat most teams in this league." The victory lifted Guernsey up to fifth place in the division ahead of next Saturday's clash with unbeaten leaders Burgess Hill Town at Footes Lane. "The boys were outstanding and we've got to take that performance on against Burgess Hill at home. "I understand they're absolutely flying and they're playing some very good football, so it'll be an interesting game," Vance added.